According to science, Little Inside Baby could arrive any day now. We're hoping that she chooses a date well after June 6th, which would allow my teacher husband to be home with me without feeling the stress of missing the end of the school year. Lennon was nearly three weeks late so that's the timeline we're most accustomed to. Nevertheless, all of the crafty projects I'd wanted to make for Baby Girl are completed, photographed, and put away, leaving me with some time on my hands during what can be an excruciating waiting period. Months ago I made a list of what I wanted to accomplish with my sewing machine before the birth, in order of priority. First on the list, for obvious reasons, was a special maternity dress. The maternity clothes I have are either borrowed, hand-me-down, or poor quality and I wanted to have one heirloom piece that I could save and pass on. The pattern is by Anna Maria Horner from her book, Handmade Beginnings. The fabric is a cotton voile from Anna Maria's Little Folks collection. I may have waited too long to make this dress as I had to add side pleats to allow for my eight and a half month sized belly. I pictured wearing it on spring days during pregnancy and then on the day we come home from the hospital. My husband threw me a surprise baby shower a couple of weeks ago—graciously, after I'd completed the dress—allowing me to wear it on that very special day as well. Before Lennon was born, I’d made a crib sized quilt for him using Amy Butler fabrics from various collections and unbleached market stall cotton. For Baby Girl, I did the same, though there is a marked difference in quality between the two. Lennon's quilt was the first I'd ever constructed and I knew very little about the best materials to use or where to find them in Berlin. Two years later, I'm not only a better seamstress but I've amassed some really lovely fabrics and materials from Berlin as well as trips home, knowing they'd bound to be used in the near future. Baby Girl's quilt is also made with Amy Butler fabrics but from her Gypsy Caravan collection. The borders are unbleached market stall cotton. The binding is the real treasure: it's made from various lengths of vintage children's fabric purchased from this Etsy.com seller. The quilt batting—now that I know all about proper quilt batting—is a beautiful 100% cotton. Unable to find Big Brother/Little Sister matching outfits that suited my sensibility, I chose to make my own. I wanted at least one photo shoot with them together wearing these pieces—complemented by pure white, long sleeved onesies—after which they can wear them throughout the summer. Baby Girl's dress is best for a three month old, so I expect it to be swimming on her at the photo shoot, but such is life. The pattern for the wrap dress can be found here and the pants are the Quick Change Trousers, again from Handmade Beginnings. The pants and dress are both reversible. The outer fabric on both is a natural linen found at Stoffhaus* here in Berlin. The reverse fabrics are tightly woven cotton lawns found at a local market stall for a song. The small patchwork accent pieces are cotton voile from Liberty of London. I purchased a scrap bag of various Liberty fabrics from this Etsy.com seller last year and was excited to finally put a few to use. *Funny story about Stoffhaus—I normally buy my fabrics at the markets, because of budget. Sometimes, however, I need a specialty fabric that the market may not have or isn’t carrying during a particular season. Stoffhaus has reasonable prices compared to other brick and mortar stores in Berlin and a fairly good selection. I've made it my ‘go-to’ fabric store, though I've always suspected that there must be a Berlin equivalent to San Francisco’s Britex Fabrics or New York’s Mood Fabrics where people in the know (read: Germans) purchase their sewing needs. I was shocked to discover that Daniel Esquivel from last season's Project Runway was sent to the very same Stoffhaus in Berlin that I shop during the ‘Europe Here We Come' challenge! While happy that I'm savvier than I suspected, it was a rude awakening to discover that Stoffhaus is as good as it gets here. Every May, my husband has a series of three and four day weeks. This year, we took advantage of his time off to make Lennon's room into a boy/girl room. Though Baby Girl won’t be sleeping in there for a good, long while, this Mama wanted to have all of her ducks in a row, looking cute, before the birth—and before the care taking of two children begins. We'd been long intending to buy matching frames for some the small artwork we have for Lennon. Mission accomplished! The fox in the sky with the long tail and the creature on the rug were drawn for Lennon by our friend and artist Josh Bauman. The middle print is vintage baby shower wrapping paper for a baby girl found last summer at my favorite church thrift shop in Tuolumne City, California. The mustache mobile hanging in front is by Jäll & Tofta. After an exhaustive search for the perfect changing pad cover in a price range that I could afford to buy in double—one needs at least two changing pad covers, in my experience—I decided to make my own. The one shown uses leftover ‘An Easter Story’ fabric, cotton terry, and vintage rick-rack. The boy and girl sides of the room mirror each other, save Lennon's Stokke Sleepi in its toddler configuration and Baby Girl's in its Mini bassinet state. Incidentally, lest you think we live like kings, we found both of these cribs gently used and for true bargains through other families here in Berlin. The fabric initials you see above both cribs are from Anthropologie and were sold without the backing. I felt that they got lost on the wall by themselves so added painted canvases behind them and the rick-rack. Though not shown, the rick-rack around Baby Girl's first initial was made by an ancient weaving machine from the Museum of Early Industrialization in Wuppertal, Germany. I purchased it there on our trip last year to see Pina Bausch's Nur Du and was so happy to find a special project to use it in. 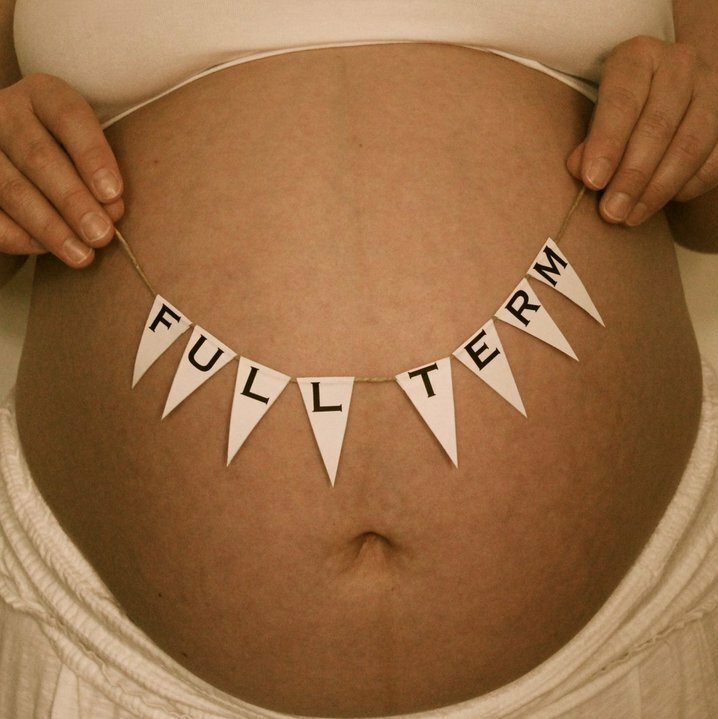 With most projects behind me, Baby Girl came upon 'Full Term' status. I took the same above picture during the same week whilst pregnant with Lennon. 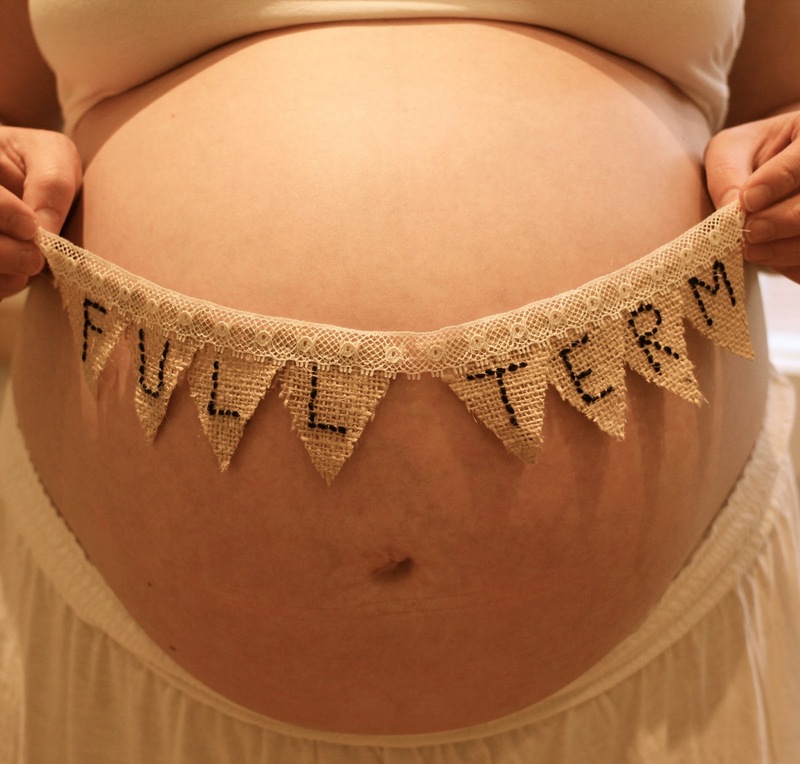 As with the passage of time and my skill development, Lennon's ‘Full Term' banner was made with printer paper and twine while Baby Girl's is, ahem, more elaborate. Specifically, her banner is made from burlap with hand embroidered black lettering, bound with lace. Very much hoping this doesn't cause conflict in later years. I'm personally a big fan of connieandvi blog. Thanks for sharing this post.